Valentine’s Day is February 14 and whether you’re in the market for the latest fashions and accessories, fine jewelry, outdoor gear or sweet treats for yourself and loved ones, you’ll find exactly what you need at Hilton Head Island’s numerous boutiques, specialty shops and factory outlet stores. Combining innovative design, precision engineering and meticulous manufacturing, the new Vibram FiveFingers® KomodoSport LS for women features the popular speed lacing system to accommodate wider feet and higher insteps for a variety of cross training activities. Birkenstock Barefootin’ in Hilton Head Village also carries over 300 different styles of fashionable and c omfortable shoes for men, women and children. (843) 837-3562 or birkenstockbarefootin.com. Visit Forsythe Jewelers in The Shops at Sea Pines Center and experience David Yurman’s “Elements Collection,” a sparkling interplay of textured gold and silver. Forsythe is Hilton Head’s finest jewelry and gifts store and the only place to offer David Yurman. 71 Lighthouse Road. (843) 671-7070, forsythejewelers.biz or facebook.com/forsythehhi. Sweet treats abound at the family-owned and operated Island Fudge Shoppe in Coligny Plaza. Fill a gift basket for your Valentine with a bountiful selection of homemade fudge, hand dipped chocolates, pecan fiddlers, praline pecans and more made on site and then have it shipped directly to family and friends. (843) 842-4280 or islandfudge.com. With five locations, from Harbour Town Marina to Shelter Cove Harbour, “Take Hilton Head Home,” with a visit to Camp Hilton Head. Since 1981, these popular stores have offered unique, imprinted resort wear for the whole family. Harbour Town, (843) 671-3600 or 671-4633; Shelter Cove Harbour, 842-3666; Coligny Plaza, 686-4877; South Beach General Store, 671-6784; Hilton Head Shirt Co., 686-5099. camphiltonhead.com. It‘s (relatively) cold and Outside Hilton Head, “The Island’s Outdoor Outfitter,“ in The Plaza at Shelter Cove has all the gear you need to stay warm this winter. Featuring premier outdoor lines from The North Face, Patagonia, Columbia, Prana and more, as well as fashionable and functional footwear from UGG, Frye, Keen, Solomon and many others, now is the time to get outside! (843) 686-6996 or outsidehiltonhead.com. “Art you can wear,“ Designs by Cleo in The Gallery of Shops features a collection of bold and beautiful, one-of-a-kind jewelry handcrafted in sterling silver with freshwater pearls and/or semi-precious gemstones. With a recent expansion, the boutique also offers one-of-a-kind hats, handbags and other unique accessories. 14 Greenwood Dr. (843) 342-7001 or designsbycleo.com. Saving is always in season at the Tanger Outlets where, in addition to great buys at more than 85 brand name outlets, you get rewarded for shopping with WinterStyle Evening Rewards, January 9-22 or during the Valentine’s Day TangerStyle promotion, January 21-February 14. Call or visit the website for details, the latest sales information and coupons. (843) 837-5410 or tangeroutlet.com. Celebrating 27 years, Hilton Head Island’s premier wine and culinary event returns March 5-10, 2012, with six days of wine tastings and auctions accompanied by the Lowcountry’s best cuisine. Buy tickets online now to save or make plans to “Uncork” the Festival on Friday, January 27 at Bomboras Grille in Coligny Plaza. (843) 686-4944 or hiltonheadwineandfood.com. 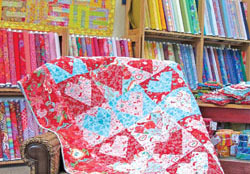 Share your love of quilting at Island Quilters, located in Park Plaza just outside the main gate of The Sea Pines Resort. Carrying a full line of 100% cotton, quilting quality fabrics and notions, stop in to see the large selection of batiks and designer fabrics or pick up a kit to easily create your own work of art. (843) 842-4500 or islandquilters.com.